God has an intimate divine power called Swaroop Shakti (स्वरूप शक्ति). As soon as the seeker starts sadhana bhakti, by the grace of Guru, Swaroop Shakti enters the seeker’s mind and starts cleansing it of all material desires. At the zenith of bhav-bhakti, mind is cleansed of all material desires and yearning for meeting God is at its acme. It is at this crucial moment that Guru makes the seeker’s mind divine and bestows divine love. Immediately God appears in front of the devotee and removes Maya forever. This perfect devotion is a divine gift and is called Prema Bhakti (प्रेमा भक्ति). The supreme God Shri Krishna is bliss. The essence of bliss is Hladini Shakti (love-potency) which means “the giver of bliss”. Essence of Hladini is prem (divine love). This prem is a divine gift hence NOT a fruit of sadhana bhakti. The divine love is unlimited and everlasting. Yet based on the sweetness and intimacy with Shri Krishna, it can be divided into eight levels. The first stage of perfect love, which is attained only by the grace of Guru upon God - realization. The Sanskrit word sneh (स्नेह​) means oil. In this state love attains excellence. The lover perceives the beloved all the time and this melts the lover’s heart. 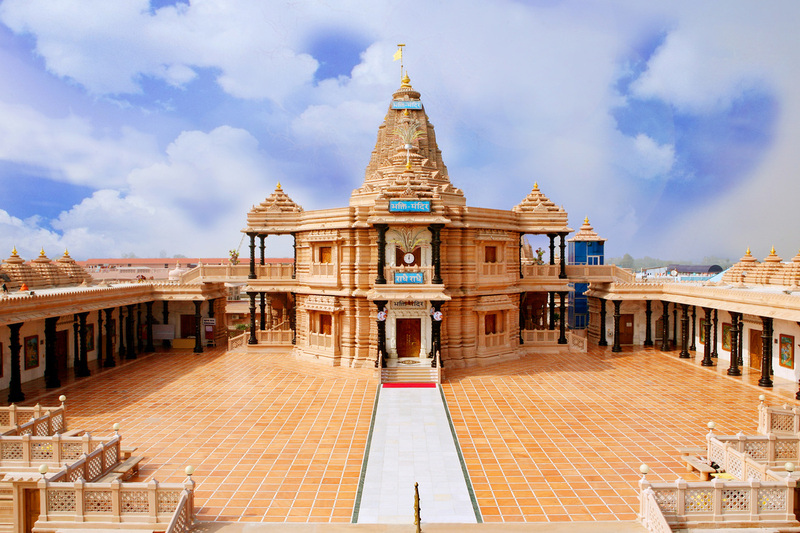 When sneh is enkindled in the heart, the longing to meet Shyam Sundar does not subside. अङ्गसङ्गे विलोके च श्रवणादौ स च कमात् । कनिष्ठो मध्यमो श्रेष्ठस्त्रिविधोऽयं मनोद्रवः । उ.नी. aṅgasaṅge viloke ca śravaṇādau sa ca kamāt । kaniṣṭho madhyamo śreṣṭhastrividho'yaṃ manodravaḥ । u.nī. Ghrit means ghee – purified butter. Ghee liquefies with warmth but solidifies in cold. Similarly, the heart of a lover with Ghrit Sneh needs care and attention from the beloved and in the absence of care and attention his heart hardens. Ghee tastes sweet only when it is mixed with sugar,otherwise not. As opposed to ghee, honey (madhu) is sweet by itself and temperature fluctuation doesn’t drastically impact its consistency. Madhu sneh is similar to honey. This love increases with or without any attention and association of the Beloved, therefore love never diminishes. The predominant sentiment in madhu sneh is “Shri Krishna is mine” that is why I love Him. Where as in Ghrit sneh the sentiment is “I belong to him”. Madhu sneh is considered higher than Ghrit sneh. “When I see Shri Krishna I see myself and when I see my reflection I see the love of my life. I am confused as to who Shri Krishna is and who I am”. “In this state (राग) due to excessive love, experiencing miseries for the pleasure of the beloved becomes a great source of joy”. 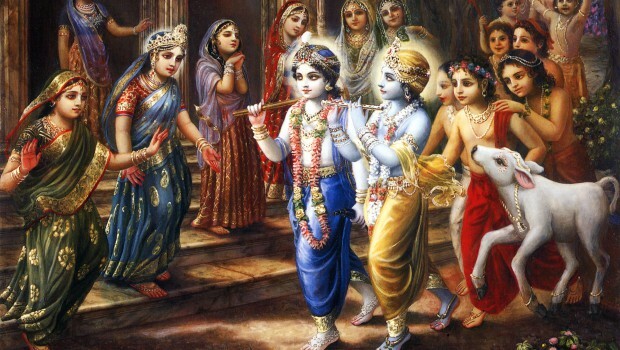 In their separation from Shri Krishna the gopis considered a single moment an entire age. Their distress of separation knew no bounds. To calm down the pangs of separation they are excessively eager to embrace the lotus feet of Shyam Sundar. To them the bliss of the touch of those feet, which are tenderer than the petals of lotus flower, is ineffable. Yet, Gopis are cognizant of the softness of His feet and the hardness of their own chest. They contain their own emotion and with great care they gently place His feet on their own chest. Imagine! For the gopis, the mere thought of causing discomfort to Shri Krishna was millions of times more unbearable than the horrible pangs of separation. Who can fathom this love? “After an entire day of yearning, when I see You the blinking of my eyelids becomes intolerable, for it blocks my vision of You for a fraction of a second”. So they curse the creator Brahma for making eyelids which innately are designed to blink. “The pure devotee always lives within My heart, and I am always in the heart of the pure devotee. My devotees do not know anything else but Me, and I do not know anyone else but them”. It proves that Shri Krishna is fully controlled by His devotees and His devotees are controlled by Him. Shri Radha personifies the flute, which is insentient, and admires its blessedness as Shri Krishna refuses to part with it. Thus the gopis are jealous of the flute. They wish to be a flute to attain more love and association of Shyam Sundar. The beauty of Shri Krishna's Divine Form is matchless. Every part of His body is more beautiful that the beauty of countless cupids. Whosoever sees His divine form says it is imbued with divine nectar. Even after seeing His whole form with my own eyes, I still wriggle to see Him. Poet Kripalu Maharaj says,"No matter how hard you try, you cannot contain the whole ocean in a pitcher". The zenith of Bhav transforms in to Maha (means grand) Bhav (महाभाव​). It is like the sun, which is beneficial in two ways. 2. Bathes everything with its bright rays. Precisely, by the inestimable grace of Shri Radha Krishna the heightened state of love Mahabhav rises in the heart of the rarest of devotees. It uproots the darkness of desire of self - happiness and fills the heart with ever-growing divine love and ever new brilliance. रूढ़ोत्येभ्योऽनुभावेभ्यः कामप्याप्ता विशिष्टताम् । यत्रानिभावा दृश्यन्ते, सोऽधिरूढ़ो निगद्यते ॥ उ. नी. rūढ़otyebhyo'nubhāvebhyaḥ kāmapyāptā viśiṣṭatām । yatrānibhāvā dṛśyante, so'dhirūढ़o nigadyate ॥ u. nī. The exclusive sentiments of Roorh Bhav reach higher and denser states of love, which are called Adhiroorh Bhav (अधिरूढ़ भाव). Only Shri Krishna can reach here. In this unintelligible state of love the unparalleled bliss of meeting beloved and pangs of separation manifest simultaneously. यः श्रीमान् ह्लादिनी शक्तेः सुविलासः प्रियो वरः ॥ उ. नी. yaḥ śrīmān hlādinī śakteḥ suvilāsaḥ priyo varaḥ ॥ u. nī. “It is found only in the most intimate group of Shri Radha. All the symptoms of ecstasy keep on springing out incessantly. There is no trace of any distress”. Can be found in Shri Radha, Shri Krishna and Asht Maha Sakhi. These symptoms appear only by the grace of Shri Radha. The same Modan Mahabhav turns into more obscure form in separation and that state of ecstasy is called Mohan (मोहन) Mahabhav. In this incomprehensible state of love the Asht Sattvik Bhav disappear and only the feeling of separation stays. This feeling is so strong that even in the presence of beloved Shri Krishna, Shri Radha experiences unbearable pangs of separation. While sitting right beside Shri Krishna or resting her head on the lap of Shri Krishna, She feels an unexcelled state of separation. Beloved Shyam Sundar keeps on reminding Her, “O my beloved Radha! See I am right here. You are in my arms. I am talking to You.” But she feels unbearable pangs of separation. His arms feel like a snake to her. This state is beyond the comprehension of even those who have the intellect like that of creator Brahma and Lord Shankar. After bearing the blaze of separation from Shri Krishna for an extended period, Shri Radha says to her innermost friend Vishakha, “O sakhi ! In separation from Shyam Sundar My heart is burning in the fire, which is much more scorching than Badvanal. I don’t know with what power I am bearing it. Alas ! if as little heat as is in the tip of this flame escapes My heart the entire creation will instantly turn into ashes.” Badvanal is a blazing fire which emanates from the third eye of Lord Shiva. It shows no grace or mercy to anyone but consumes everything that comes in its way. The best idea of all these states of ChittraJalp can be taken from Shrimad Bhagvat Mahapuran, Gopi Geet in 10th canto. This divine stage of deepest love is also known as Divyonmaad (divine ecstasy). Among the two aspects of adhirudha mahabhava, maadan (मादन​) or amatory intoxication is the fullest development of all the sentiments of divine love. 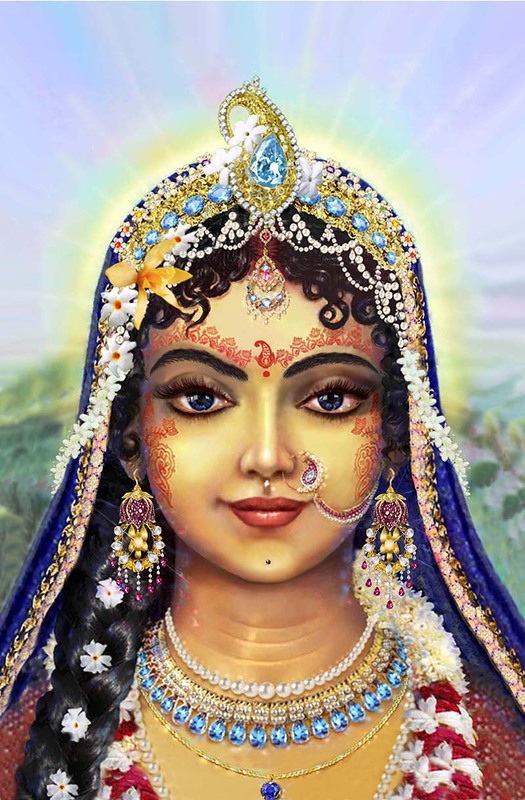 Shri Radha alone experiences this bliss. Even Absolute Brahm Shri Krishna (called par) cannot access this exclusive stage of love. There is nothing beyond this bliss. That is why this state is called Paraatparah (परात्पर), which means it is beyond par (aka Shri Krishna). Upon revelation of Mahabhav, Shri Radha experiences the limitless bliss of all aspects of Beloved Shri Krishna, all at the same time. E.g. the bliss of simultaneously talking to Him, seeing Him, touching Him, kissing Him, embracing Him, smelling His fragrance etc. Although Shri Radha is established on the highest stage of love, where Shri Krishna also cannot reach, yet she is enraptured by everything of beloved Shyamsunder. Let alone human being this is beyond comprehension of creator Brahma, Lord Shankar, sage Narad etc. as well.